"It is becoming pretty clear that repetitive impacts to the head, even over a short period of time, can cause changes in the brain," said study senior author Chunlei Liu, a professor of electrical engineering and computer sciences and a member of the Helen Wills Neuroscience Institute at UC Berkeley. "This is the period when the brain is still developing, when it is not mature yet, so there are many critical biological processes going on, and it is unknown how these changes that we observe can affect how the brain matures and develops." One bonk to the head may be nothing to sweat over. But mounting evidence shows that repeated blows to the cranium—such as those racked up while playing sports like hockey or football, or through blast injuries in military combat—may lead to long-term cognitive decline and increased risk of neurological disorders, even when the blows do not cause concussion. "There is a lot of emerging evidence that just playing impact sports actually changes the brain, and you can see these changes at the molecular level in the accumulations of different pathogenic proteins associated with neurodegenerative diseases like Parkinson's and dementia," Liu said. "We wanted to know when this actually happens—how early does this occur?" The brain is built of white matter, long neural wires that pass messages back and forth between different brain regions, and grey matter, tight nets of neurons that give the brain its characteristic wrinkles. 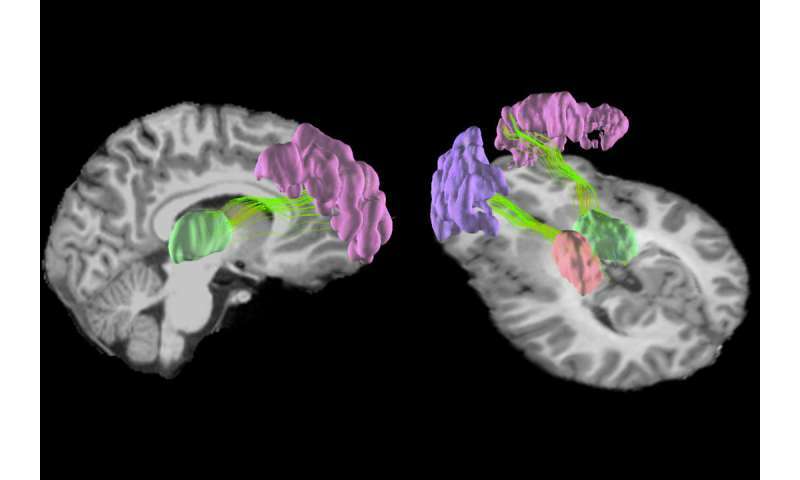 Recent MRI studies have shown that playing a season or two of high school football can weaken white matter, which is mostly found nestled in the interior of the brain. Liu and his team wanted to know if repetitive blows to the head could also affect the brain's gray matter. "Grey matter in the cortex area is located on the outside of the brain, so we would expect this area to be more directly connected to the impact itself," Liu said. The researchers used a new type of MRI called diffusion kurtosis imaging to examine the intricate neural tangles that make up gray matter. They found that the organization of the gray matter in players' brains changed after a season of football, and these changes correlated with the number and position of head impacts measured by accelerometers mounted inside players' helmets. "Although our study did not look into the consequences of the observed changes, there is emerging evidence suggesting that such changes would be harmful over the long term," Liu said. Tests revealed that students' cognitive function did not change over the course of the season, and it is yet unclear whether these changes in the brain are permanent, the researchers say. "The brain microstructure of younger players is still rapidly developing, and that may counteract the alterations caused by repetitive head impacts," said first author Nan-Ji Gong, a postdoctoral researcher in the Department of Electrical Engineering and Computer Sciences at UC Berkeley. However, the researchers still urge caution—and frequent cognitive and brain monitoring—for youth and high schoolers engaged in impact sports. "I think it would be reasonable to debate at what age it would be most critical for the brain to endure these sorts of consequences, especially given the popularity of youth football and other sports that cause impact to the brain," Liu said. annoyingmousie, why would any violent profitable event be forbidden in a dystopia? Unless driving it underground would make it more desirable to consumers and therefore more profitable for the owners? This url describes some of the serious issues for soccer players. And we can always discuss "soccer hooligans". annoyingmousie your whine against "global football" sounds as if your afraid that your addiction to lite-beer commercials will be cut off! I would propose an examination of the possible occurrence: How much surge of blood pressure is the result of body impact? If we are to assume that absent a head impact, then what are the possible results of body impact on capillary vessel BP in the case of a hard tackle or impact with the ground. Assuming an effect in body impacts ( W/O a head injury component ) contact, could cumulative body impact - ( being much more prevalent ) be a damaging factor worth consideration? Time to end football at every level.